Food has never been the main attraction — or even a side attraction — of my trekking adventures. Instead, it has primarily been an inconvenient necessity, largely consisting of rice, beans and other forms of sustenance. Without fresh vegetables, herbs and garlic, it all starts to taste the same after a day or two. Of course, mountain adventures aren’t about the food. They are about fulfilling ambitions, testing both your physical and mental limits and maybe learning something new about yourself. Sometimes, too, there’s a lesson in there about horticulture. Last year, I trekked with a group of friends to Everest Base Camp for our second high-altitude adventure. (Two years earlier, we summited Kilimanjaro at 19,300 feet.) Everest Base Camp wasn’t as challenging as Kilimanjaro — it was 2,000 feet lower than Kilimanjaro and not nearly as steep of a climb. But there was more to see on the Everest walk. Kilimanjaro was mostly bare rocks, while the Everest views were filled with snowy peaks and tiny villages. We slept in small lodges and visited cultural sites along the way, including a monastery where we were blessed by a Nepalese monk. And then there was the food, including the unexpected gardens. During our Kilimanjaro trek, our daily sustenance consisted of the aforementioned rice and beans and a lot of ginger tea. But on our Everest trip, we had a much wider variety of food. There were lots of potatoes and French fries, processed meats, soups and, at one point, yak cheese (which I can tell you is nothing like Asiago or Parmesan). However, the food took a surprising turn when we reached the house of our lead guide, Ang Temba Sherpa. Temba had summited Everest once and would have attempted it again if he hadn’t promised his mother that he would never go back after she found out he had gone up the first time. He and his wife, Yangzee, live at 13,100 feet in the village of Pangboche, on the trail to Mount Everest. 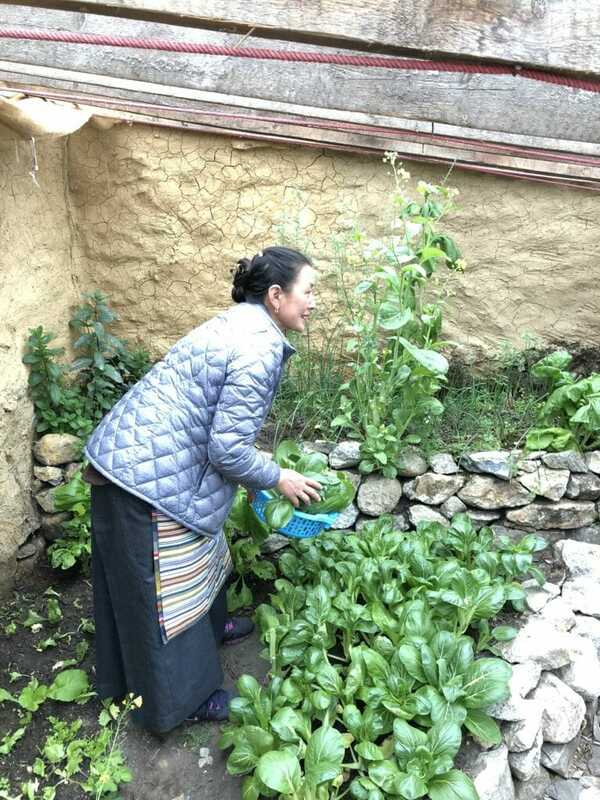 Once we had taken off our boots and settled in for a rest, Yangzee made us a delicious dinner, the most memorable parts of which were the vegetable side dishes and a fresh salad. The Sherpas in the area can normally only grow potatoes. They live amid some of the most spectacular high-mountain scenery in the world, referring to the Khumbu Valley as “beyul,” which means “blessed sanctuary.” But it is a hardscrabble life high in the Himalayas. The Sherpa people must travel throughout the year to survive — in monsoon season, when they can graze their yaks, they move up the valley. To purchase rice, salt, spices and staples, they trek down the valley to the trading village of Namche Bazaar. Everything is carried by porters or on the backs of yaks. There are no wheeled vehicles, bicycles, ox-drawn carts or motor vehicles in the Khumbu — the trails are just too steep. So, in 2012, without an alternative means to get fresh vegetables, Temba and his wife decided to build their own greenhouse at 13,000 feet. 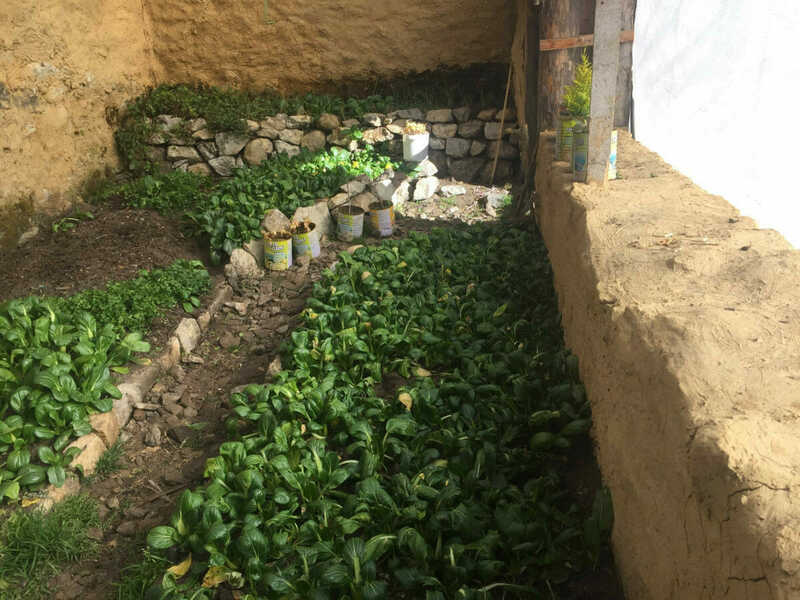 Using stones and mud for the walls and corrugated plastic and plastic sheeting for the roof, they crafted a utilitarian greenhouse. Now, they are able to grow tomatoes, bok choy, broccoli, cucumber, squash and lettuce throughout the year, as well as flavor-boosting herbs like mint, chives and coriander. 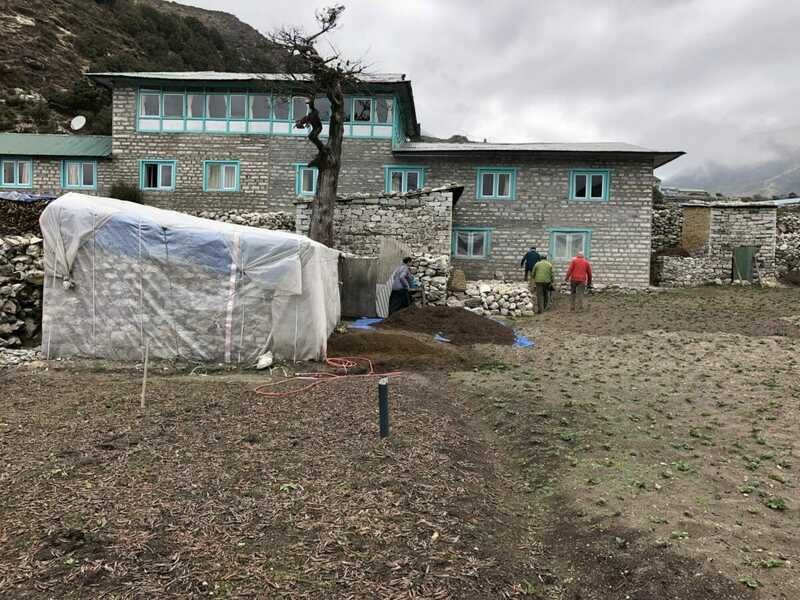 In recent years, the growing staple of Khumbu (Sherpa) agriculture at these altitudes has changed: Sherpas began to bring in outside seeds for potatoes, as the new varieties grow faster. But they also lack flavor and longevity and rot much faster when stored in the ground, as Sherpas have traditionally done. Buckwheat, a nutritious grain that is essential for growing children who live at high altitudes, is also widely grown in the area. Another challenge in recent years has been a lack of snow on the ground during winter. While temperatures are still extremely cold — perhaps even colder than before — without the snow cover, the soil is too dry in the spring, making the start of growing season difficult. Then add monsoon season — the constant rains from mid-June to early September — to the mix. Here, farmers are seeing more rain than ever before — and too much of it. Difficulties aside, Temba and his wife are rightfully proud of their greenhouse and gave me a tour, describing each vegetable variety as if it were one of their children. We enjoyed a great evening at their lodge, which included a viewing of Everest memorabilia and fascinating photos that they had collected over the years. But the best part had to be that salad at 13,000 feet. Came across your article in Smithsonian on the Mt. Everest greenhouse. Would like to see more of what you cover. Please bring back your print version! Greenhouse gardens at 13K feet are more common than you realize. I was recently in Tibet, and Lhasa is at 13,000 feet. Taking the road to Everest Base Camp, we saw many greenhouses, both small-scale and commercial-scale.